The great Apple App Store cleansing continues. After wiping out adult apps in a controversial purge last month, the company returned this week for its next target: Wi-Fi scanning apps. Although Apple has made no formal announcement, a number of apps used for actively scanning for Wi-Fi, like WiFi Where, have mysteriously been dropped from the App Store. 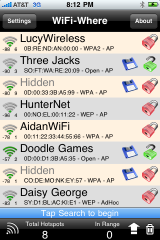 The Register claims that only apps using a “private framework” to detect Wi-Fi have faced the axe. Aside from individually notifying app developers, Apple has so far publicly remained mum on the issue, offering no explanation of why it removed the apps.